In challenging environments, we need to use heterosis. We need cross-bred cows in these challenging environments. Deseret Ranches uses three different herds. They have a Simbrah sired cowherd, Brangus sired cowherd, and a Deseret Red sired cowherd. A Deseret Red is 3/8th Red Poll, 3/8th South Devon, and 1/4 Brahman. The Simbrah sired cows are breed by Brangus bulls, the Brangus sired cows are mated to Deseret Red bulls, and Deseret Red sired cows are mated to Simbrah bulls. 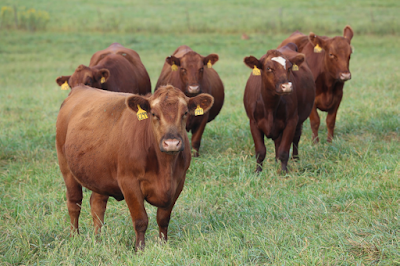 The Santa Gertrudis breed was developed at King Ranch 90 years ago. They have a seedstock Santa Gertrudis herd where they perform selection with an internal EPD system. They then have a multiplier herd where they make Red Angus x Santa Gertrudis F1 bulls. These bulls are then used in the commercial herd. 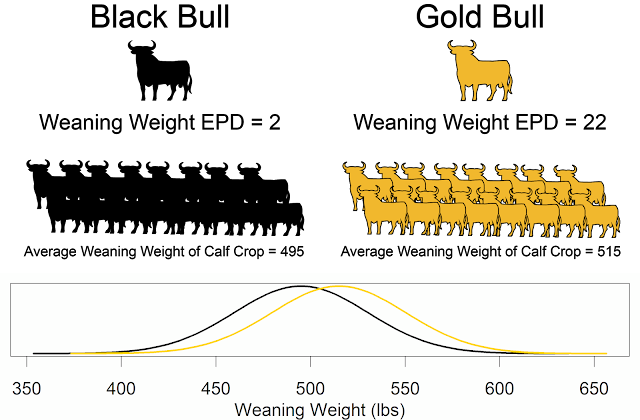 Replacement females are developed from the commercial herd. They have Heifer Pregnancy EPD and Breed Back EPD from their internal EPD evaluation. Kentucky 31 based forage, so they deal with the stress of fescue toxicosis. Their breeding objective is average daily gain on fescue forage. They develop bulls on fescue over the winter. These bulls do not look good in the spring. As the fescue starts to grow in the spring, some of the bulls snap out of it over the summer. They shed their wooly coats and look good. Other bulls never snap out of it and are culled.